Since most of the commonly used PET tracers have a short radioactive half-life, on-site production of the radioactive isotopes is required. The dedicated accelerator, a National Electrostatics Corporation 9SDH-2 electrostatic tandem accelerator, is adjacent to to the PET scanner and radiochemistry lab. It is capable of accelerating >100uA of protons or deuterons to 7 MeV with fine beam shaping and positioning capabilities, with high yield targetry systems for 11C, 13N, 14O, 18F, and newly developed PET radioisotopes such as 17F. A research chemistry lab with dual fume hoods and a class 10,000 clean room with class 100 laminar flow hood are available for radiotracer production and radiopharmaceutical preparation. The lab is well equipped for continuous (in-line) production and delivery of short lived tracers. The facility includes separate animal handling and transport accommodations, including appropriate air handling considerations. Other support resources include: a fully equipped machine shop; developmental and diagnostic electronics apparatus; a clean stainless steel transfer line network for specialty gases and liquids, including radioactive and corrosive materials; and ample bench space for cutting edge instrumentation development and repair. 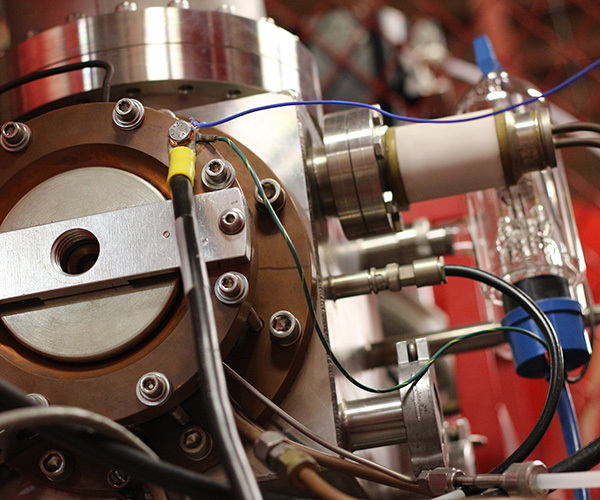 Our lab has extensive collaborations with the accelerator facilities in Medical Physics and the new WIMR facility, which can provide us with additional PET tracers. These facilities specialize in synthesizing large amounts of high specific activity PET neuroligand tracers.